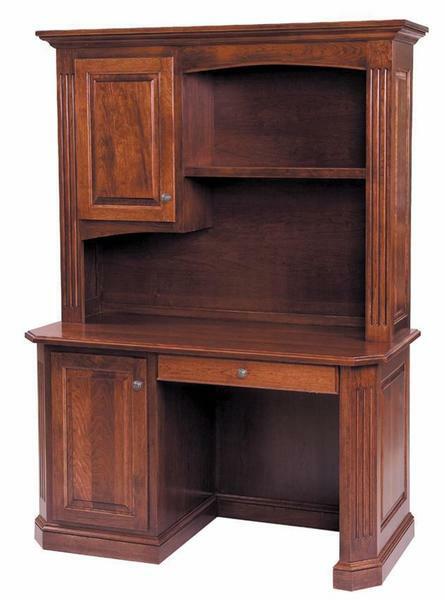 Set up your laptop and get ready for a productive day with the Amish Buckingham Work Station with Optional Hutch Top. This luxurious work station complements your home or business office with a stunning solid wood collection of shelving and cabinetry. With Amish made furniture comes the option to customize. Make this solid wood desk your own by selecting your choice of wood and stain. Consider adding the hutch top for additional spacious shelves to display family photos or flower vases. Choose from a keyboard drawer or pencil drawer in the keyhole area. The desk has a 1" solid top and beautiful crown molding as well as fluted angled corners. Be sure to review our exciting blog post, "8 Office Desks That'll Get Your Job Done," to learn more about desk styles and functions. Select a custom made Amish Desk Chair to keep you seated in comfort and style as you work. All of our solid wood furniture is made in America. This Buckingham Work Station with Optional Hutch Top comes to you from a woodshop in Ohio. Call one of our Amish Furniture Specialists today at 1-866-272-6773 with any questions on this heirloom quality office furniture.